Do you remember the 7 Easy and Healthy Breakfast Recipes I had shared a few days ago as a part of my Instagram project – #NoWhiteBreadBreakfast? Well, I have managed to add more recipes to the project and thought I would compile them. 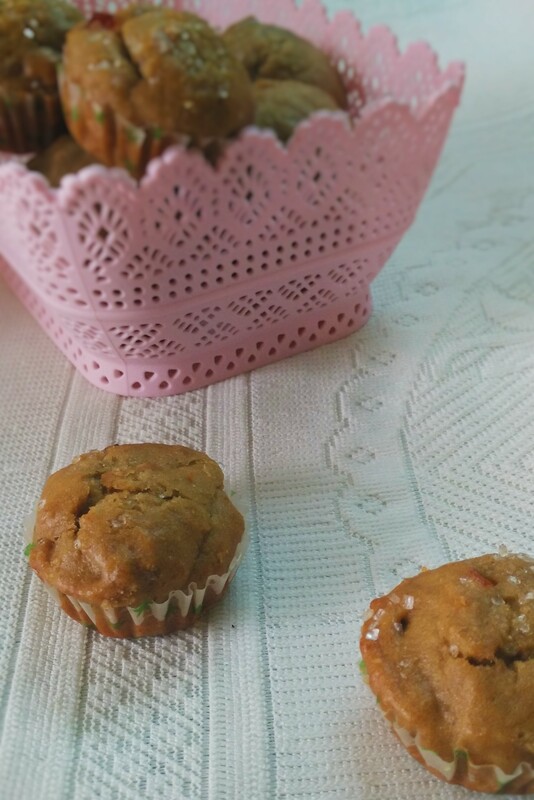 This time I made a mix of classic Maharashtrian, south Indian and Punjabi dishes along with some muffins and a quick-fix super healthy breakfast bowl. Mix all the ingredients of the patty together and keep aside. Heat oil in a pan and add cumin seeds. When they splutter add ginger and saute for a minute. Throw in beetroot, carrot and rest of the ingredients and saute for 4-5 minutes. Let it cool. Divide potato mixture in 6 equal parts. Flatten each one on your palm, keep a little filling in the centre, close it and roll them into flat patties. Mix cornflour in water to make a paste. Heat little oil in a nonstick pan, dip each patty in the cornflour paste and place it on the pan. Fry till they turn golden on both sides. 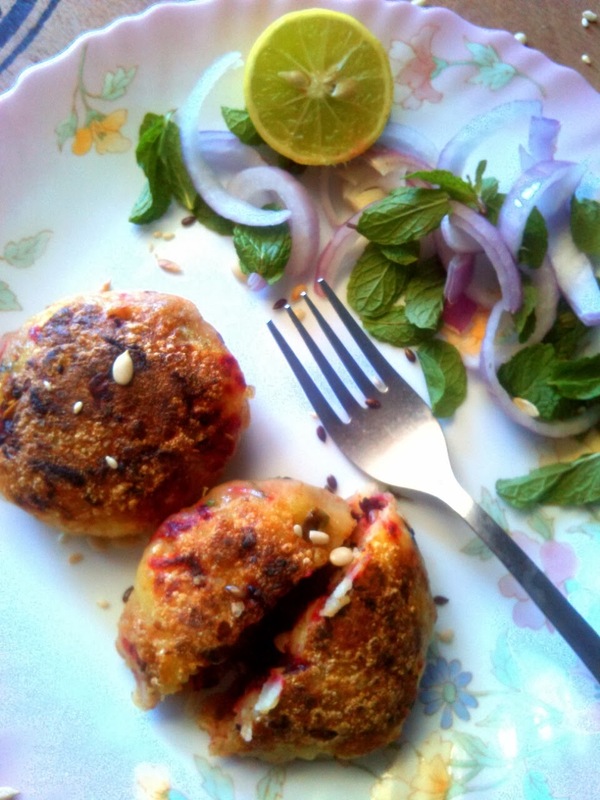 Serve with green mint chutney and sliced onions. Sometime in August last year I visited a restaurant which is now my new favourite for vegetarian, especially Gujarati food. Thackers, at Girgaon Chowpatty a favourite among the Gujaratis living around that area. In a true foodie/Gujarati spirit, the locals queue up at Thackers for lunch/dinner every weekend. The restaurant serves an a la carte menu of Gujarati delicacies along with Continental and Indian dishes but is more famous for its Thali. A short drive away from Thackers is Samrat restaurant located near Churchgate Station. This too, like Thackers is popular among those who love Gujarati food. 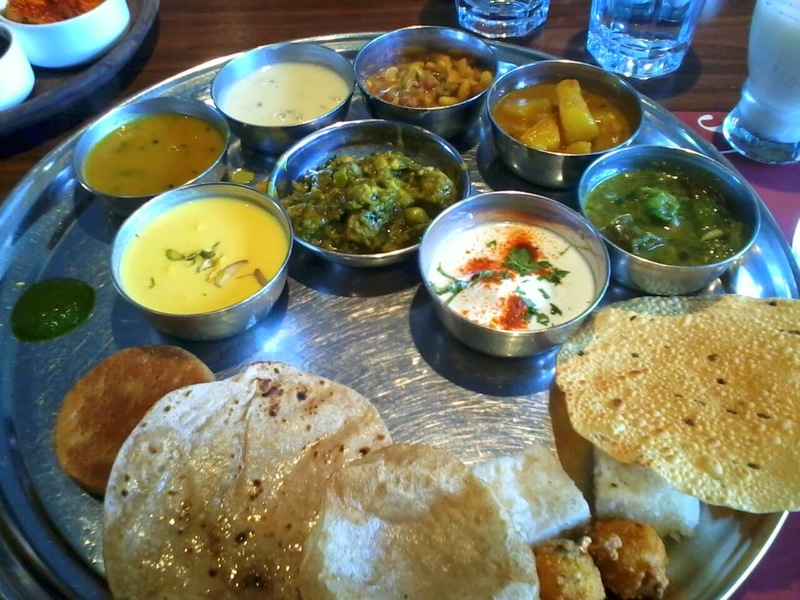 Apart from traditional Gujarati thali restaurant also serves regular Indian and Continental food. Last weekend, after a drive to Marine Drive with family we decided to go to Samrat for dinner. Since we’d picked it over Thackers I couldn’t stop myself from comparing the two. Here too, we ordered thalis and couple of dishes from the a la carte menu. The thali at both the restaurants had traditional dishes including farsan (fried or steamed snack), subzis, dal, kadhi, rotis, puris, thepla, rice preparation, dessert and chaas (buttermilk). At Thackers we were served dhokla and bhajiya as farsan while Samrat served fried gawar ki fali (cluster beans), matar ki kachodi – deep fried Indian pastry stuffed with green peas and dhokla – steamed rice flour cakes. Farsan at both the places were good, we like the ones at Samrat a little more. I prefered the subzis served at Thackers; we were served aloo ki subzi, undhiyu and a palak subzi at Thackers. At Samrat we had chhole instead of the palak subzi. We also had Surti dal and kathol – a combination of pulses, at Thackers. The kadhi at Samrat was tad too sweet while the one at Thackers had a good balance of sweet, spicy and tangy flavours. Now coming to the most important part, rotis. Fresh, thin, hot and ghee laden rotis were served at Thackers but the ones at Samrat disappointed us. They were cold, uncooked and dry and even after repeated requests we weren’t served hot rotis, we had to switch to eating puris. The puran-poli and thepla was nice though. From the a la carte menu at both the places we ordered panki – rice pancakes steamed in banana leaves. At Thackers (Rs 85) the panki was thin, hot and had a robust flavour of garlic. It came with a green chutney which complemented the dish perfectly. The panki at Samrat (Rs 140) was disappointing, it was thick, cold and had a stale taste. it was served with a green chilli pickle which couldn’t save the dish either. Dessert was good if not great at Samrat, we had gulab jamuns and fruit custard. At Thackers we were served rasmalai which was a perfect end to the meal. Apart from the quality of food there’s a vast difference in price too. While a thali at Thackers will cost you Rs 295 you’ll have to shell out Rs 355 at Samrat which is as much as the thali chains like Rajdhani, Maharaja Bhog and Panchvati Gaurav. However, these chains serve much better food with variety of dishes and quick service. After trying out thalis at both Thackers and Samrat, my vote goes to the former for their authentic and fresh food, pleasant service and pocket friendly price. Given that I am such a big fish eater it only makes sense to start the blog year with a fish recipe. 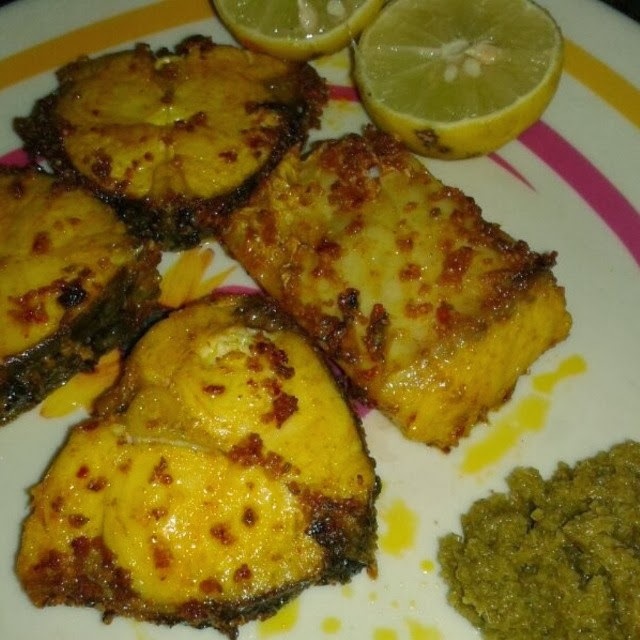 Rohu is a river water fish and it’s taste in itself is so sweet that you don’t need too many spices to prepare it. 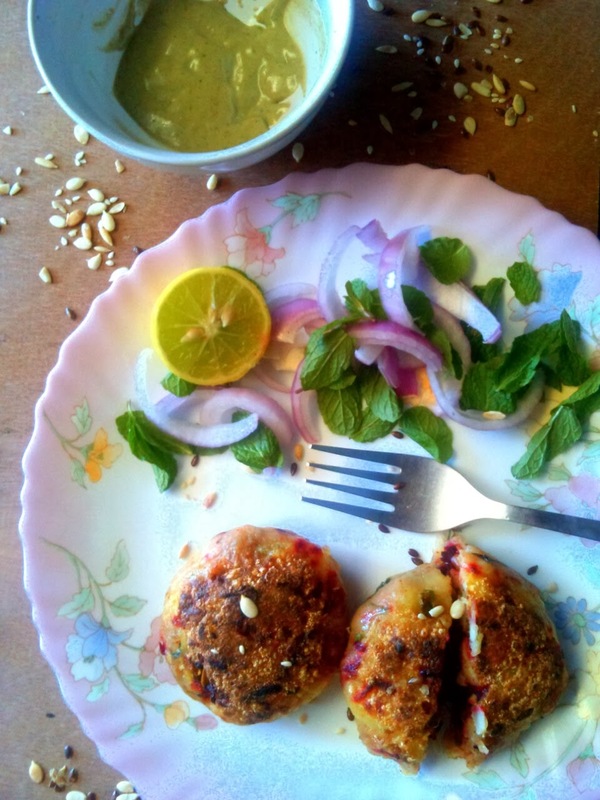 This one is a very Bengali/UP preparation with just mustard and ajwain seeds. Cooking in mustard oil creates some magic in the kitchen and I for one cannot resist the aroma. The recipe is simple. Try it and thank me later. Wash the fish, marinate in turmeric powder and salt, keep aside for half an hour. Wash away the turmeric powder and salt. Mix salt, red chili powder, mustard seeds and ajwain seeds together. Add this mix to fish pieces. Heat oil in a pan. Add fish pieces and shallow fry till they are crispy on the edges. Sqeeze lemon juice on top and serve with green chutney.